Have you stayed in motels, backpackers or hotels that may have been infested? You could have Bed Bugs! Bed bugs are small crawling insects with a flat oval shape about the size of an apple pip.Their flattened body allows them to squeeze into small cracks and crevices and as a result they are hard to detect and eradicate. They are blood-sucking insects that require blood for nutrition and development. Bed bugs feed mostly at night when their host is asleep. Bites cause small, hard, swollen welts on the skin that may become inflamed and itch severely.There are five juvenile stages leading to the adult bed bug. Adults are about 6mm long, reddish-brown in colour with the juveniles (nymphs) a similar shape but lighter in colour and smaller. Eggs are about 1 mm in length, white to cream coloured and under magnification pear-shaped. They are well concealed and not always obvious. Bed bugs prefer to hide in cracks and crevices during the daytime and come out at night to feed on their victim. The blood meal takes three to five minutes and usually goes unnoticed by the victim; as the person is asleep! After feeding, the bite may become inflamed and itch severely in sensitive people. In extreme cases there may be a severe allergic reaction requiring urgent medical treatment. Typical hiding places are in tufts, folds and seams of the mattress and base; cracks in timber bed framing and mattress slats and around the bed head. Harbourage is not limited to these areas and in all cases cracks and crevices in other areas need to be inspected. Including: carpet edges, picture frames, curtain folds, electrical fittings, wardrobes and any area into which bed bugs can squeeze. The cryptic nature of bed bugs and their ability to hide in small inaccessible spaces means that they will be protected from pesticides unless applied thoroughly and correctly. Eggs are not affected by pesticides. Both characteristics have significant implications for treatment. However Exopest uses Cryonite (dry ice), that eliminates all life cycle stages without the use of pesticides and room closure. No quarantine period required. 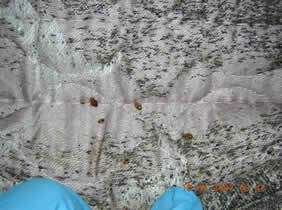 Shed Bed Bug skins and faeces in harbourage areas. Control of bed bugs requires the cooperation of the building owner or premises manager, working along side the Exopest pest control technician. If an person suspects a bed bug infestation they should first ensure there is no chance of spreading the problem from room to room. Bed bugs are great hitchhikers, so do not spread the infestation by moving bedding, furniture etc from one room to another. In extreme cases it may be necessary to isolate all equipment and materials that come into contact with the infected room. Even minor infestations from a chance transfer can become a major problem. The essential first step in Bed Bug management is pest identification and determining the extent and level of infestation. Site inspection is crucial. When this is known the Exopest technician can assess the treatment options and time needed for treatment. After inspection and before treatment, a wash down of surfaces affected with blood spotting not only improves the appearance but also allows a follow up inspection to be done with greater confidence. In extreme cases it may be better to discard the mattress – burning or tipping is recommended, again ensuring that other items do not become infested. Care must be taken when moving affected items, sealing them in plastic bags before they leave the room is recommended. Bed linen should be washed in hot water followed by a hot drier. Sensitive materials can be placed in a freezer allowing enough time for the entire volume of the item to reach the temperature of the freezer. Treatment- Non Chemical or Chemical ? Treatment involves the direct use of registered product to harbourages such as bed base, bed slats, carpet edges, tack board below carpet , cracks & crevices, wardrobes and cupboards. The premises would then need to be quarantined for 7-10days if chemically treated until a follow up inspection could declare the infestation dead. Reapplication would be necessary if live bedbugs were found on this visit and a further 7-10days quarantine of those rooms and a final follow up inspection. There is no warranty with Bed Bug treatments. Non Chemical – The Latest!! Exopest uses the latest treatment Cryonite (dry ice) from Europe which literally freeze the insects to death. 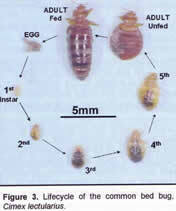 The advantage is it kills all stages in the bed Bug life cycle, including eggs and adults at the time of treatment. Cryonite is safe and kind to the environment allowing you to occupy that room almost immediately resulting in little inconvenience or loss of revenue in commercial situations. Whilst the bed linen and any likely infested clothing should be bagged and removed for cleaning, the mattress, electrical appliances, computers and sensitive items can be treated directly without damaging them. Dry Ice is like snow, but colder at -30 degrees!! Steam – we are currently researching the use of another non chemical Bed Bug treatment using Steam. Bed Bugs are very sensitive to heat – whether extreme cold or extreme heat. Dry vapour steam at over 120 degrees celsius instantly kills all adults, larvae and eggs and leaves no residual. Very safe to use and very effective. Steam can also be directly applied to mattress seams and edges – the very place the insects hide. A follow up is still recommended in 7-10 days at which time a safe residual treatment if required can be applied as a precautionary measure against future bed bug infestation. IT IS HIGHLY UNLIKELY A QUICK ONE OFF CHEMICAL TREATMENT WILL BE SUCCESSFUL – DON’T WASTE YOUR MONEY AND RISK BEING FURTHER DISTRESSED BY ACCEPTING “CHEAP” REMEDIES. Domestic situations: we suggest if you are traveling frequently then check the mattress in your Hotel room regularly or invest in a mattress cover, which will help eliminate the most common harbourage sites.